Whether you’re reading this now, or tuning in from the future, you’ll note I’m reviewing a Christmas beer in February. But this isn’t any old Christmas beer I’m drinking a couple months late — no, this beer was a gift I received Xmas of 2016 from my Dad. I forgot to take it home with me, and in his enormous prudence, he chucked it in his wine fridge to age quietly until I remembered it. 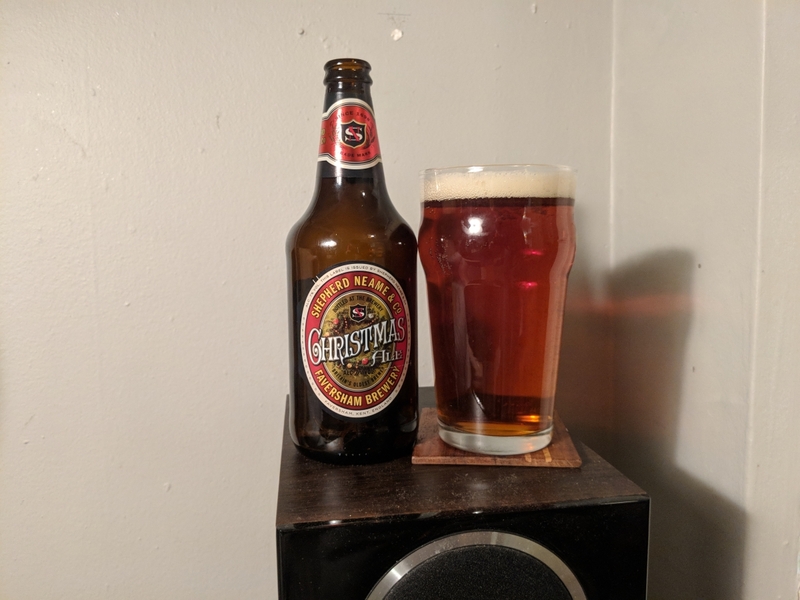 I’ve had Shepard Neame Christmas Ale before. It’s bad. It’s not just bad as a winter ale, most of which I dislike (some of which are pretty good, though). It’s thin-feeling, metallic tasting and overly-spiced. It has a rich maltiness but it doesn’t matter much compared to the rest of its flaws. But that was before a year in the cellar. Can a bad beer turn good? It seems implausible. But if the aged-beer community is to be believed, laying an appropriate-styled brew down for a year year or two can have a healthy impact on the quality. Could the same be true for Shepard Neame Christmas Ale? In its big English bottle with old school labeling, this Christmas Ale looks stuffy but composed. It pours a lovely amber-brown, with a relatively vibrant head. In my experience, beers that have been aged tend to lose some of their fizz. 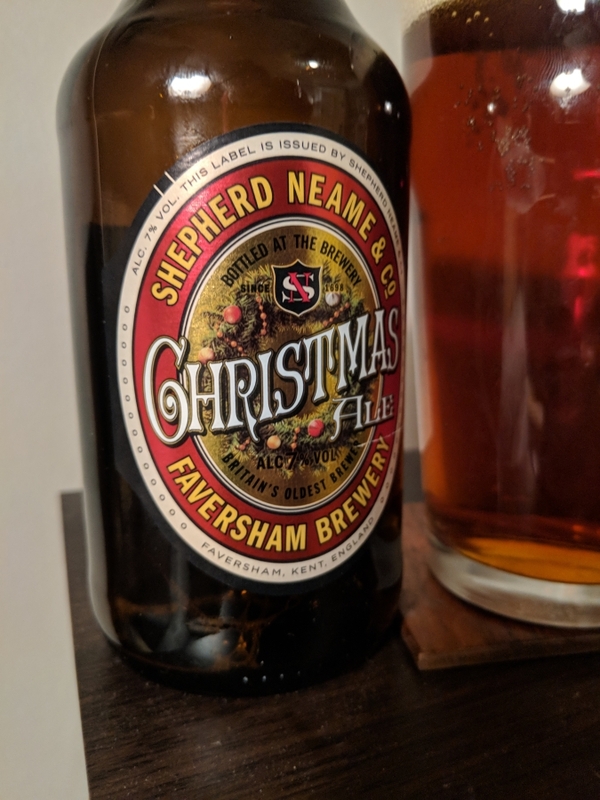 But in the case of Shepard Neame Christmas Ale, I found it overly carbonated when I first tried it. After a year and change to mellow out, it had way softer effervescence which made it a nicer sipping experience. Point to aging. Unfortunately, the problems this beer had in its youth follow it into maturity. If anything, the woeful metallic taste is stronger — the number one least pleasant characteristic. I thought it could be an off bottle, but I had three to compare. The winter ale spices might have softened, and I like the maltiness and oatmeal-raisin-cookie undertones which I believe to be a positive side effect of its year in the cellar. But overall it was a poor showing. At 7% alcohol, it’s a good candidate to age, probably for significantly longer than I had it. If you happen to like this beer fresh, I reckon it’s worth it to lay it down and pick it up in a year or more. So can a bad beer be rescued with aging? Probably not — at least not for Shepard Neame Christmas Ale. I don’t recommend it fresh, and there are better brews to lay down. Skip sipping this one, slow or otherwise.